It’s tough to watch this year’s NFC East. Eagles fans have long prided themselves on the fact that their team plays in one of the toughest divisions in the league. This year, that just isn’t true. 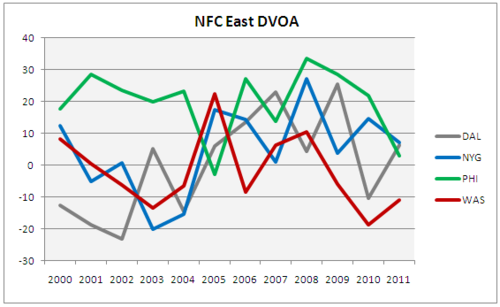 So it turns out, on a purely average DVOA basis, that this is not the worst NFC East in the last decade. In fact, this year’s group is barely below the 2010 average. Perhaps the real reason this year’s group seems so awful has more to do with the lack of even one good team. To this point, among all “best teams in the NFC East,” this year’s Giants are by far the worst. In every year other than 2000, at least one team has posted a DVOA score of at least 20 percent, and the 2011 Giants would be no better than third in the division in any other year since 2005. The way they’ve played this year, the Eagles should not have even the 3 percent chance they have of winning the division. Widespread mediocrity will do that for you. Tagged with Philadelphia Eagles, NFL, NFC East, 2011, Football Outsiders, Dallas Cowboys, New York Giants, Washington Redskins, Statistics, Charts. December 15, 2011 by Brian Solomon.